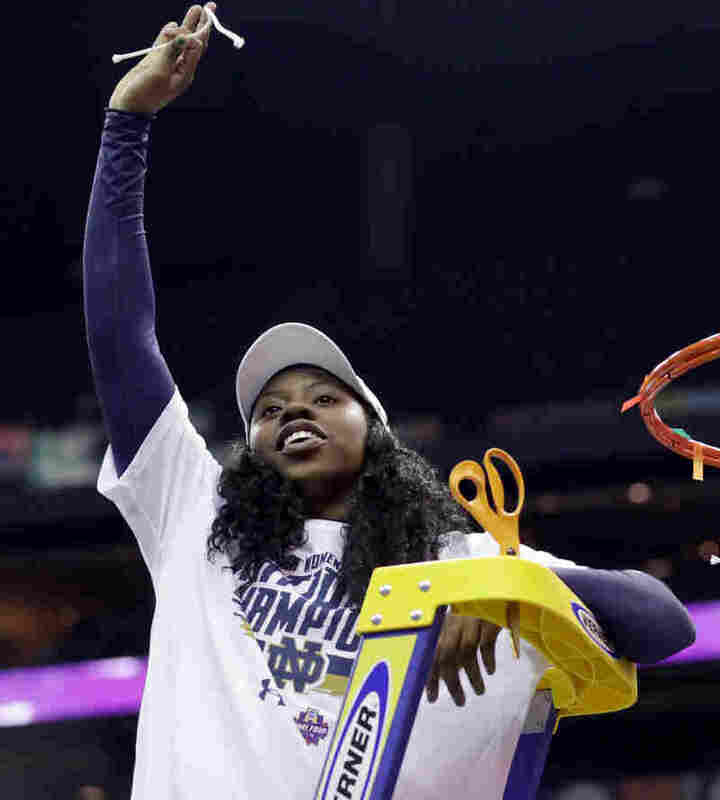 WATCH: This Last-Second Shot Gave Notre Dame The Women's Basketball Crown : The Two-Way With 0.1 seconds left on the clock, guard Arike Ogunbowale hit a 3-pointer to give Notre Dame the NCAA championship over Mississippi State 61-58 Sunday night in Columbus, Ohio. Updated at 4:30 p.m. ET. It was a shot of a lifetime and junior guard Arike Ogunbowale nailed it for Notre Dame. She sank a 3-pointer from the corner with 0.1 seconds left on the clock, beating Mississippi State 61-58, and giving Notre Dame its second women's basketball title Sunday night in Columbus, Ohio. Notre Dame scored its first title 17 years ago — also on April 1. "We just kept fighting, and thank you, Jesus, on Easter Sunday," Notre Dame Coach Muffet McGraw told The New York Times. Ogunbowale was named the most outstanding player in the come-from-behind victory. She scored 16 of her 18 points in the second half. Notre Dame's Arike Ogunbowale celebrates by cutting down the net after a 61-58 victory over Mississippi State in the final of the women's NCAA basketball tournament Sunday in Columbus, Ohio. Mississippi State dominated much of the game. In the second quarter, the Irish only had three points — setting an NCAA Tournament record for the fewest points in a period. In the third quarter, Notre Dame was down 15 points, and with less than 2 minutes in the game, they were down by five. "Mississippi State star Teaira McCowan missed a layup with 27.8 seconds left, and both teams turned the ball over in a wild sequence. McCowan fouled out of the game stopping an Irish fast break after consecutive turnovers and that set up the final 3 seconds. The court was cleared, and Mississippi State tossed a futile inbounds pass into the lane as the buzzer sounded." It was the second straight game that Ogunbowale hit a shot in the final second to carry the Irish. On Friday, her jumper with one second remaining in overtime knocked off previously unbeaten UConn in the semifinals. Notre Dame had lost the title game four times over the last seven years. It nearly ended the same way for the Irish, had they not had the biggest comeback in the final since the women's tournament began in 1982. A previous version of this story incorrectly stated that Notre Dame won its first title on Easter Day in 2001. In fact, it won the title on April 1, 2001. But Easter fell on April 15 that year.